Law enforcement • Sheriffs say federal rangers overstep their authority and blame Utah-Nevada special agent for escalation of conflicts. Trent Nelson | The Salt Lake Tribune Garfield County Sheriff James "Danny" Perkins is a leading critic of BLM law enforcement. He says the federal agency's officers refuse to recognize the authority of rural sheriffs and coordinate with local law enforcement. Perkins was photographed in his Panguitch office, Friday September 12, 2014. 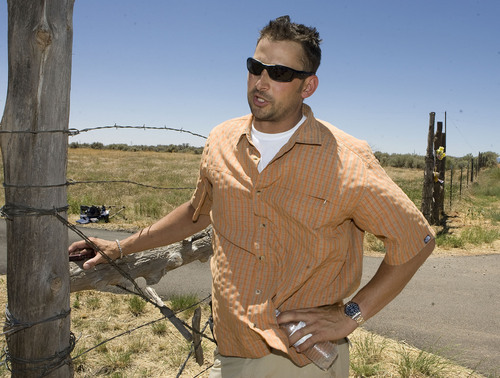 Al Hartmann | The Salt Lake Tribune Dan Love, BLM's special agent in charge for Utah and Nevada, is the target of numerous complaints by rural Utah sheriffs who blame his unwillingness to respect local authorities for a rupture in their relations with BLM law enforcement. State officials have asked BLM to replace Love, pictured here in 2009 while leading a federal raid on the Blanding home of James and Jeanne Redd. Love supervised the undercover operation into illegal artifact trafficking which the Redd family alleges led to James Redd's suicide. BLM special agent Dan Love was among the federal agents and archaelogists to search and remove artifacts from the Redd house in Blanding on Tuesday. He is at the front gate that leads to the Redd house. Al Hartmann | The Salt Lake Tribune Defendants charged in the archaelogical looting investigation make their initial appearance in federal court in Moab Thursday morning. Mike Wingert with the U.S Marshall Service left, talks with BLM special agent Dan Love outside the courtroom. Court security officer Del Badham at right. Trent Nelson | The Salt Lake Tribune Garfield County Sheriff James "Danny" Perkins is a leading critic of BLM law enforcement. He says the federal agency's officers refuse to recognize the authority of rural sheriffs and coordinate with local law enforcement. Perkins was photographed in his Panguitch office, Friday September 12, 2014. Trent Nelson | The Salt Lake Tribune Garfield County Sheriff James "Danny" Perkins is a leading critic of BLM law enforcement. He says the federal agency's officers refuse to recognize the authority of rural sheriffs and coordinate with local law enforcement. Perkins was photographed in his Panguitch office, Friday September 12, 2014. Public Enemy No. 1 for rural Utah sheriffs just happens to be a fellow peace officer: Dan Love, the Bureau of Land Management&apos;s special agent in charge. 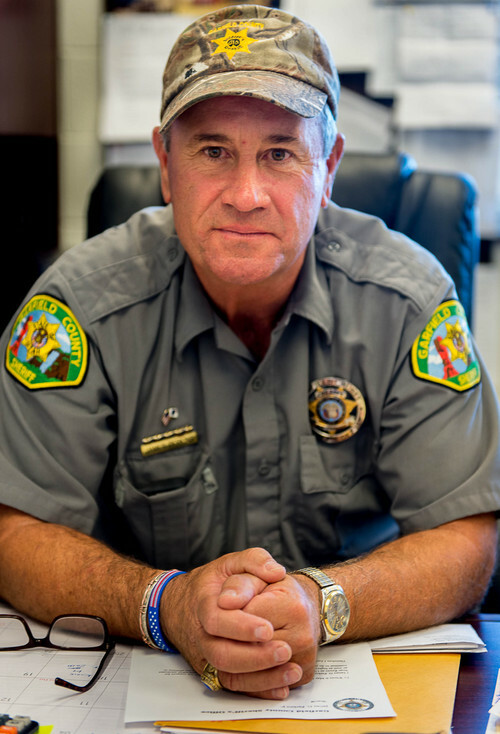 Elected law enforcement officers from Nephi to Blanding call him an arrogant and dishonest bully who has little regard for local authority and dodges accountability, derailing a collaborative approach to police work on the state&apos;s federal lands. Love reportedly just laughed when Garfield County Sheriff James "Danny" Perkins relayed ranchers&apos; complaints about federal officers removing plastic feed tubs from the range and threatening the ranchers with litter citations. He drew early controversy during an undercover probe of artifacts trafficking in Blanding in 2009. More recently, Love led the BLM&apos;s aborted roundup of Cliven Bundy&apos;s cattle following an armed standoff with anti-government protesters at the Utah-Nevada border. While tensions with federal authority are hardly new to Utah, local officials say friction has intensified with Love at the helm of BLM law enforcement in Utah and Nevada. Now top state officials want Love gone. "This is untenable," said Lt. Gov. Spencer Cox. "There comes a time when personalities get in the way of productivity." For his part, Love is not talking. Local officials may share some of the blame for the poor relations. According to court filings, elected leaders and even deputies have confronted BLM rangers, publicly challenging their authority. But Love&apos;s critics say his intimidating attitude and unwillingness to consult with counties exemplify a "culture of arrogance" that undermines cooperation in Utah&apos;s remote reaches. 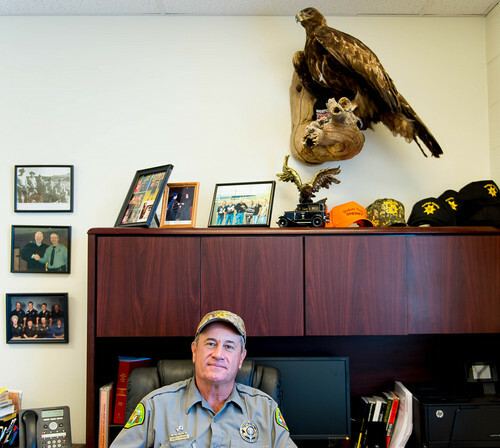 The public loses, safety is compromised and tax dollars are wasted, Utah&apos;s rural sheriffs say. "This refusal to coordinate, coupled with a lack of any meaningful oversight, has created a perfect environment where the abuse of federal law enforcement powers can occur," Perkins recently testified before a congressional committee. For example, Perkins and San Juan County Sheriff Rick Eldredge say, rangers pull over citizens without probable cause, even in areas where they have no jurisdiction, "bully" ranch hands, berate tourists for parking vehicles off dirt roads and illegally close roads. Federal officers refuse to help with searches and rescues, or when they do, they get in the way. BLM law enforcement officials would not speak on the record, but an agency spokeswoman said BLM does takes complaints seriously. "When we receive specifics regarding these allegations, we look into the incidents and take corrective action if appropriate," Celia Boddington said. "However, it is difficult for us to address allegations when they are either not reported to us or reported several months after the event." Still, the agency is revising its command structure to make law enforcement responsive to local concerns. "We enjoy positive and constructive relations with the majority of sheriffs," Boddington said, "and couldn&apos;t get our job done without working closely with them and their teams." Broken accords • One recent flap surrounding Love stems from the contracts the BLM signs with some sheriff&apos;s departments, compensating them for patrolling public lands and conducting searches and rescues. State and local officials allege Love recently "terminated" such contracts with five counties as retribution for the state&apos;s enactment last year of HB155, which limits the authority of officers employed by federal land agencies. While discussing the contracts with BLM&apos;s top law enforcement official, Salvatore Lauro, recently, Cox asked him to assign a new special agent in charge for Utah. "They are not willing to make that replacement at this time," Cox said, "but they are willing to work toward improving those relations." The lieutenant governor said he and other state officials have negotiated face to face with Love, and have gotten nowhere. "If I was going to battle, I&apos;d want him beside me," Cox told a recent meeting of Utah&apos;s Commission on Federalism. "But I don&apos;t want him instigating a war." Love has declined lawmakers&apos; invitation to speak at legislative committees. BLM officials won&apos;t discuss individual employees and wouldn&apos;t make Love available for an interview. But they denied retribution played any role in the contract decisions. According to Boddington, the BLM allowed the contracts to expire after higher-ups found them legally defective during routine reviews. Agreements with Kane, San Juan, Emery, Juab and Grand county sheriffs  worth about $178,000 a year  expired in 2012. "The BLM&apos;s review of the contracts was underway prior to the bill introduction," she said. "There is no connection of any kind between our review and HB155." To patrol Utah&apos;s 23 million acres of public lands, the BLM employs 15 uniformed rangers or field officers. Seven special agents who investigate violations of federal law related to public lands and natural resources also work for BLM, which administers about 40 percent of Utah&apos;s land base. All report in varying degrees to Love, who has served in the top spot for less than a decade. Threat to public safety? • The situation has become so tense, or perhaps juvenile, that federal and local officers sometimes threaten to arrest each other. Garfield and at least three other counties have passed resolutions declaring federal authority unwelcome, alleging BLM law enforcement presents a threat to "health, safety and welfare." Retired rangers say the tensions date back to the 1970s, when the BLM began assigning field rangers. Controversial BLM operations, such as the artifact raids in Blanding or the Bundy standoff at Bunkerville, Nev., bring "long-simmering" resentments to the surface, said Ed Patrovsky, who patrolled the 3.2-million-acre Craig district spanning parts of nine northwest Colorado counties. "The problems lie on both sides," Patrovsky said. "Some sheriffs are territorial. They see federal officers as competitors rather than cooperators. Some of the federal officers come in with the same attitude." He said the BLM&apos;s hiring patterns in the past two decades have contributed to the problem. Instead of recruiting rangers from other land agencies, it now tends to tap agencies such as the Border Patrol and Bureau of Prisons. "They are hiring rangers that don&apos;t have the natural resource ethic that ties them to the land," Patrovsky said. Still, today&apos;s widespread anti-federal sentiment complicates rangers&apos; jobs. "Things can snowball and gather their own momentum without any fault on the part of the ranger," said Patrovsky, who was deputized by the Moffat County sheriff during his years in Craig. "There is an atmosphere of fear and intimidation out there and rangers are afraid to speak out." 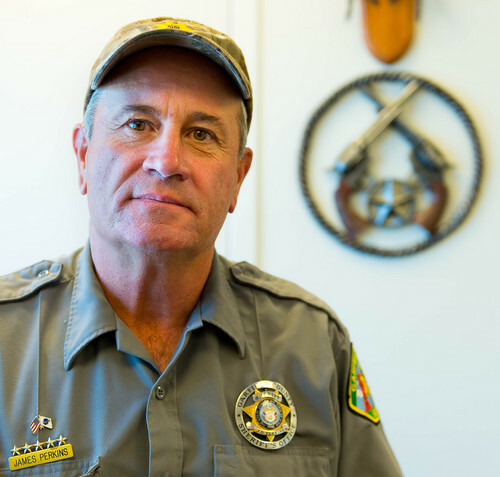 It is common for Utah sheriffs to deputize U.S. Forest Service and National Park Service officers, but no BLM rangers are currently deputized in Utah. &apos;He had no jurisdiction&apos; • BLM arrest statistics seem to undermine claims of an overbearing presence. Rangers made just three arrests in Utah in 2012, and issued 27 citations and 110 warnings. County officials, however, say they are more concerned with incidents that don&apos;t wind up in court, but illustrate a lack of respect toward the sheriff&apos;s role as a county&apos;s chief law enforcement officer. At a recent congressional hearing, Garfield County Commissioner Leland Pollock likened BLM law enforcement operations to "the Gestapo." Perkins said tourists have complained they will never return to Garfield County after their treatment by rangers in the Grand Staircase Escalante National Monument. In his legislative testimony, Eldredge said a BLM ranger confronted him on his family&apos;s property adjacent to BLM land and the Ute Mountain Ute community. The ranger, who didn&apos;t recognize the sheriff, erroneously admonished Eldredge against driving on tribal land. The ranger backed off and apologized when Eldredge identified himself, but the sheriff was in no forgiving mood. "He didn&apos;t even know whose land it was," Edredge told lawmakers earlier this month. "He just wanted to give me a bad time. Even if it was [land administered by Bureau of Indian Affairs], he had no jurisdiction to tell me stay off." Many county leaders don&apos;t hesitate to praise BLM Utah Director Juan Palma, regarded as a warm public servant committed to bridging the federal-state divide. But whatever goodwill Palma builds, Love and officers under his command put a match to it, local officials say. Pollock points to an effort by Garfield County officials to hammer out a law enforcement contract with the BLM, similar to the agency&apos;s agreement with neighboring Kane County. Garfield County is also home to the Grand Staircase monument, and last year, its six-deputy department spent $70,000 on helicopter time and 265 staff hours rescuing monument visitors. Love refused to execute a contract, according to Pollock. "We budgeted based on my negotiations with Juan Palma, and all of the sudden he said he couldn&apos;t do it," Pollock said. "That&apos;s sick and wrong. We hired a deputy that would have made the Grand Staircase a safer place, and this one guy killed it." Meanwhile, Perkins contends the BLM ranger assigned to the county refuses to coordinate with deputies on searches and rescues. He once prematurely called in a helicopter, Perkins said, which sat idle for four hours before it returned to base, refueled, and came back with another pilot. BLM cops and civilians • Counties also complain that BLM law enforcement operates at cross purposes with its own civilian land-management staff. Perkins and Pollock cited an incident where a ranger posted roads with closed signs shortly before the opening of a limited entry hunt. Locals complained to the BLM field manager, who determined that the roads should be open, according to the sheriff. But when the manager took down the signs, the BLM ranger threatened to arrest him. The ranger kept his hand on his holster as if preparing to draw his service weapon, Perkins said, and the BLM manager told the sheriff he felt his life was in danger. In a more documented case, BLM law enforcement clashed with civilian colleagues in Garfield County over a dead body. Love and a team of FBI agents unearthed human remains discovered in the national monument in 2008, reasoning the site could be a crime scene. The monument archaeologist objected, however, believing the site was likely historic and any excavation should have been led by scientists. The archaeologist was baffled that law enforcement did not notify him of their plans, and that Love failed to return his phone calls, according to BLM documents obtained through a records request. The archaeologist was excluded as the cops dug up the body with a TV crew filming. The remains turned out to be that of an American Indian who died in the 19th century. All sides agree better cooperation would minimize such disagreements and make the job of law enforcement easier. The challenge will be re-establishing trust.